We were huffing and puffing our way up Maryland Heights, making the fairly steep climb to its 1448 foot summit, when a lone man went running by us. He was running downhill, so we didn’t think much about it. But then 20 minutes later, he passed us again. This time, he was running up hill, with a man and a dog trailing him. On his third pass, back down hill, he paused as his chocolate lab came to us for a pet. We asked questions and found that he was training for a 100 mile run in the Colorado Rockies. This was his fourth round-trip up and down Maryland Heights that morning, he said, and the other man and the lab had joined him on this leg as pacers. After they ran on, my companions and I agreed: (1) we were impressed and (2) he was crazy. Maryland Heights is the highest of the mountains that surround Harpers Ferry, West Virginia. It was the site of the first Civil War battle — September 12-15, 1862 — on northern soil. 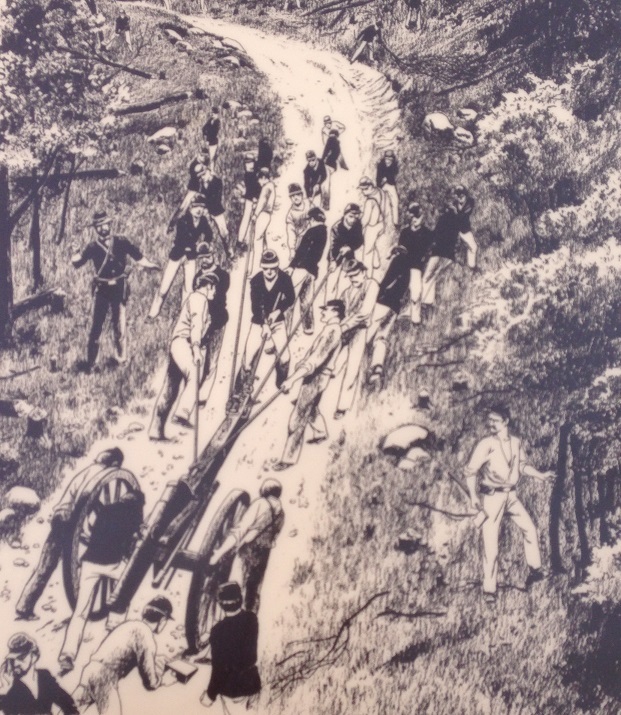 Confederate forces attacked Union troops stationed at the top of the mountain and the Union abandoned their position, leaving the town of Harpers Ferry – site of a Federal arsenal and a critical railroad junction – unprotected. Confederate occupation of Harpers Ferry lasted only a few days, however. On September 17, all of Robert E. Lee’s Army of Northern Virginia, including the troops occupying Harpers Ferry, were called to the Battle of Antietam, about 15 miles north. The Confederates lost Antietam and fled back to Virginia, leaving Harpers Ferry to the Federals once again. 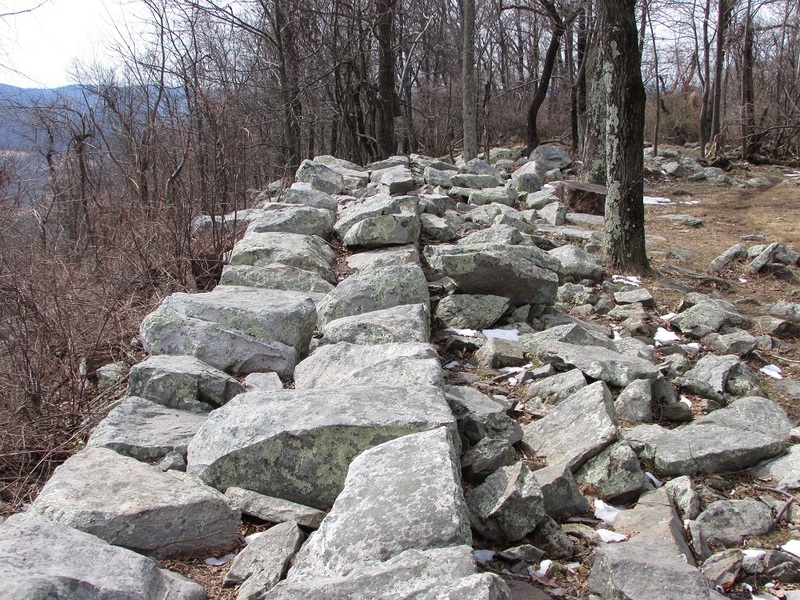 This time, Union General George McClellan doubled down and built a stone fort at the top of the Heights. Maryland Heights is now part of Harpers Ferry National Historical Park and run by the National Park Service. The nice part of that is that there’s really good descriptive signs all along the hiking path. All that’s left of the fort, batteries, magazines and earthworks are trenches and piles of stone, but the signs point out what what was where and how they worked. More impressive than the guy running multiple laps up and down Maryland Heights: Union soldiers pulled cannons weighing many tons up the steep mountain to arm the fort and batteries. One was a Parrott Rifle with a tube that weighed nearly 10 tons. It “could hurl a 100-lb shell more than 2 miles,” according to the NPS description. A sign shows a drawing of soldiers pulling ropes attached to a cannon. I’d rather be training for a 100 mile run. What Abe missed by not climbing to the top of the mountain was the spectacular view of the valley below. There are two trails – an easy 2.8 mile round trip to an overlook with a year-round view of Harpers Ferry (the first photo at the top) and a steeper 2.2 mile loop to the stone fort at the top of the mountain. We do both for a total of about 5 miles. The view, the history and the mildly challenging but not-crazy-hard climb make it our favorite hike in the greater DC area. 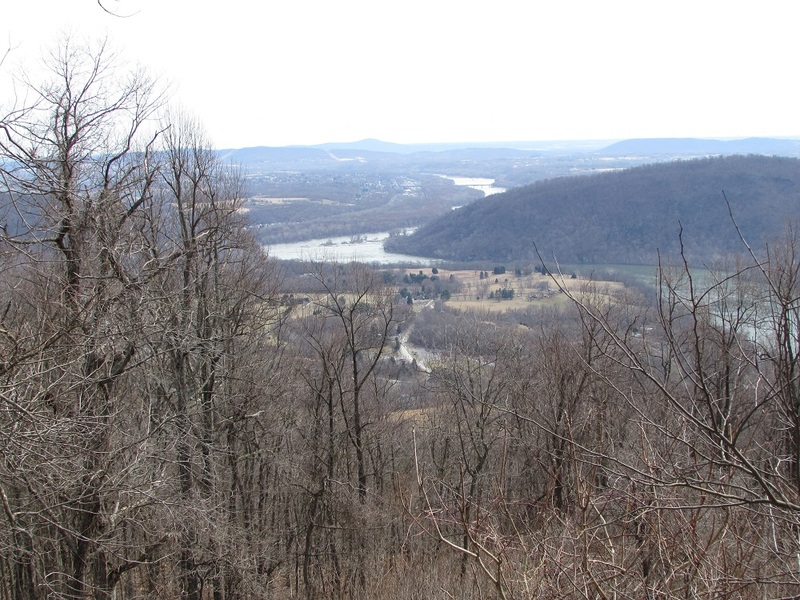 Gallery | This entry was posted in Maryland and tagged Battle of Harpers Ferry, Harpers Ferry, Maryland Heights, Maryland hiking. Bookmark the permalink. Even though I live pretty close, I have never visited Harper’s Ferry. Now that I know Lincoln was there, I have even more incentive. Harpers Ferry is a beautiful little town and definitely worth the visit. Thomas Jefferson was also there, so you’d get two presidents in one visit. Thanks for the tip on the double presidents! Harper’s Ferry has been on my list, but I didn’t know about the Maryland Heights part. Thanks! 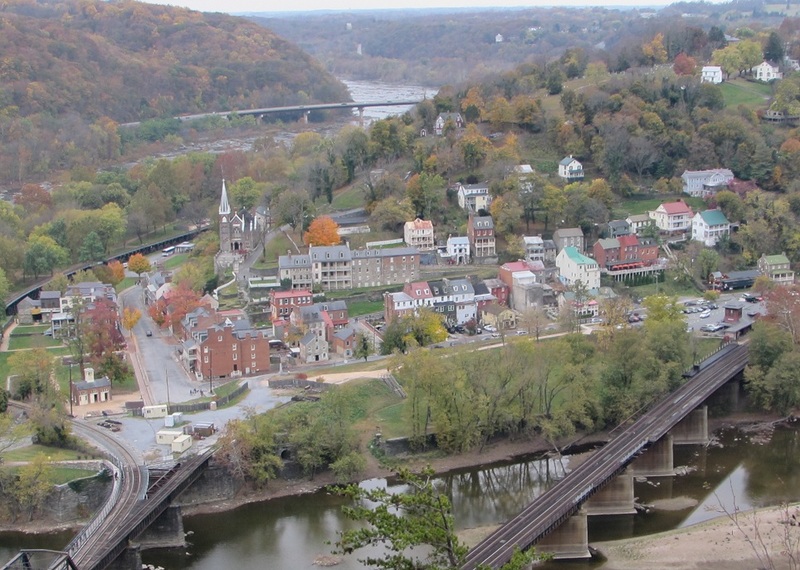 Since you’re a hiker, you’ll definitely need to do Maryland Heights (at least the part that goes to the overlook above town) if you go to Harpers Ferry. And you should go to Harpers Ferry because its a lovely little town and worth a day trip. Good story, I enjoyed it! Thanks. We go often but it never occured to me to write about it until now. This sounds like a great weekend trip for us. I can lure my husband into it with the prospect of a good hike and get a history fix at the same time. Any good restaurants in the area? Sad, but there really aren’t good restaurants in Harpers Ferry, at least that we’ve found (so if you come across one, please let me know). It’s a tiny, tiny town, 90% of which is made up of the National Historical Park. The only decent place we’ve eaten (and we’ve only been for lunch) was the Cannonball Deli. It’s a tiny place in the basement of a house in the historic area and while we couldn’t guess by the name, it’s a Middle Eastern place where I had a wonderful and huge falafel sandwich. We’ve tried several other restaurants in the historic area, all of which were mediocre at best. Two food recommendations in closeby towns, though: Beans in the Belfry in Brunswick, Maryland (a coffee shop/cafe in a repurposed church, good for breakfast or lunch) and the Main Cup in Middletown, MD (a regular, full service restaurant). Brunswick is only about 8 miles/10 minutes from Harpers Ferry and Middletown is probably about 15 miles. Why is it always the way out in that neck of the woods. Can’t tell you how many times we’ve looked at each other and wondered “don’t the people around here eat at anything other than Waffle House?” You’ll love this: I packed a really nice for lunch for us once and we were sitting eating it on picnic tables in the mountains when some hikers came through. And they said “Pardon me, do you have any Grey Poupon?” LOL! Makes me want to carry around Grey Poupon just in case someone asks me for it.